Dr. Aparna Chandrasekaran of Jersey Medical Weight Loss Center eases the burden for individuals who are struggling with weight issues. Obesity in the United States has swelled to epidemic proportions. In 2016, obesity affected nearly 40 percent of American adults, or approximately 93.3 million people, according to the U.S. Centers for Disease Control and Prevention. Obesity can cause a number of life-threatening health conditions, including heart disease, stroke, and sleep apnea. But there is hope, according to Aparna Chandrasekaran, M.D., founder and medical director of Jersey Medical Weight Loss Center in Somerset, N.J. For patients who are concerned that they may be on the verge of this epidemic, Dr. Chandrasekaran recommends first and foremost that the patient see a qualified medical professional. In many cases, obesity may be the result of genetics. Regardless of the cause, Dr. Chandrasekaran emphasizes that no one should be embarrassed or ashamed about a weight issue. While a dietitian, a nutritionist, or a personal trainer can start a person down the path to better health, she says one must seek out the expertise of an Obesity Medicine specialist, also called as Bariatric Physician, such as herself to bring the weight down effectively in a healthy manner and also to keep it off. At Jersey Medical Weight Loss Center, a patient’s weight loss journey begins with a comprehensive diagnostic workup, wherein Dr. Chandrasekaran and her team compute a patient’s body composition using a special scale. This helps to “get to the root” of a patient’s weight problem, she says. From there, she designs a purely customized treatment plan focused on nutritional intervention, weight loss medication, supplements, and behavioral counseling. “I prescribe many FDA-approved medications for weight loss, as well as lipotropic vitamin supplements designed to boost patients’ metabolism,” she notes. A human connection is vitally important to the success of the weight loss process. 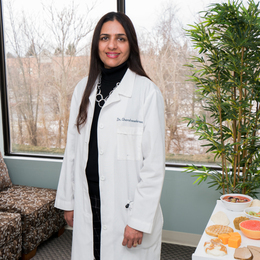 That being said, Dr. Chandrasekaran and her staff work together to make the path to weight loss as smooth as possible, focusing on all aspects of a person’s life—not just the numbers on the scale. Dr. Chandrasekaran, who is board certified in both Internal Medicine and Obesity Medicine, has been practicing Internal Medicine in New Jersey since 2004. She is a member of Obesity Medicine Association, and is actively involved in spreading awareness about obesity through her blogs, radio show, and presentations. Her article “Body Mass Index: Is It Reliable Indicator of Obesity?” was published in the Journal of Nutrition & Weight Loss in February 2018. Dr. Chandrasekaran utilizes the latest aesthetic treatments, including CoolSculpting and Kybella, to help patients get rid of the stubborn fat and attain the ideal body to complement their weight loss. CoolSculpting is an FDA-cleared body-contouring treatment designed to address the stubborn areas of fat still present after a patient has lost weight, including the arms, chin, stomach, and thighs. It is scientifically proven, safe and noninvasive. Treatments last 30 to 75 minutes and, most exciting for patients, require no “downtime” after a procedure. Kybella is an FDA-cleared injectable treatment for double chin. The treatment is administered in the office in just 15 to 20 minutes. As with CoolSculpting, the treatment has no downtime of which to speak.